Few of those who grow orchids in Victoria appreciate how lucky we are compared with most European and North American growers, for whom an expensive heated glasshouse is essential during winter. In Melbourne we can grow many orchids quite well in a semi-shaded corner of the garden, although a shade house generally provides better results. 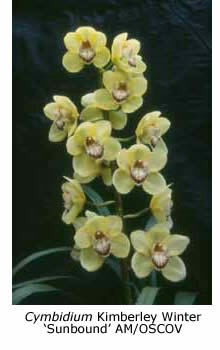 Cymbidiums are the most popular orchids because they are hardy and easy to grow and flower. 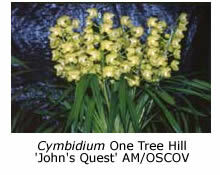 There are 40-odd different species in the genus Cymbidium. 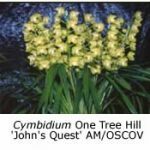 From these species many thousands of different cymbidium hybrids have been bred and an incredible variety of colours is now available. Flowers vary in size from miniatures barely 50 mm across to monsters that span almost 150 mm. Most hybrids have upright flower spikes, some carrying as many as 20 blooms; others with pendulous inflorescences are best grown in hanging baskets. 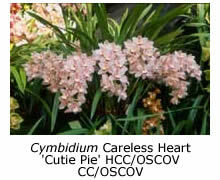 Depending on their parentage some hybrids flower as early in the year as March, while some late-flowering hybrids may retain their blooms until Christmas. Most produce their flowers between July and October. Beginners are advised to buy plants in flower. By all means choose the colours you like best but also make sure that the plant has healthy foliage and large pseudo-bulbs (the bulbous growths at the base of the foliage). A plant with lots of leafless pseudo-bulbs (back-bulbs) has probably led a hard life and may need to be re-potted immediately. Place the plant in your garden where it will receive dappled sunlight throughout the day. A totally shaded area is unacceptable – the plant will continue to grow but it is unlikely to flower again! The ideal situation is a sunny spot covered with shade cloth (shade factor 50%). Keen growers usually have a shade house fitted with a clear fibreglass or polycarbonate roof to protect their plants from frost and wet, wintry conditions. Although this roof prevents the flowers from being damaged by rain or hail, it obliges the grower to water throughout the year. Most growers fit a shade-cloth cover above the roof between September and late April but remove it during winter so that their plants receive as much light as possible at that time. 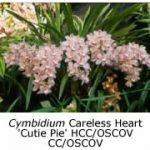 Cymbidiums should be watered throughout the year. Provided their potting mix is in good condition, they benefit from being watered on every sunny day during the summer months. Much less water is necessary during winter, once or twice each week being sufficient. Liquid fertilizers should be applied weekly in summer, monthly in winter. Slow-release fertilizer may also be applied after the plants have flowered. Cymbidiums should be re-potted every two or three years, whether they have outgrown their pots or not. The weathered pine bark sold as potting mix for orchids in Victoria continues to break down over time, eventually becoming undesirably acidic and also producing a sludge that limits the free drainage necessary for healthy root growth. The orchid should therefore be removed from its pot, and the roots freed from old potting mix. Remove any soft, decayed roots and leafless pseudo-bulbs before re-potting the plant in fresh mix. Never re-use old potting mix, as it may transfer disease from one plant to another. For the same reason, wash your hands before re-potting another orchid, and never re-use old pots unless you first sterilize them chemically. Having successfully grown and flowered your mature cymbidiums, try growing some small seedlings and mericlones. The latter are exact replicas of prize-winning plants, and although a little dearer than un-flowered seedlings, they guarantee a flower that will be true to description. 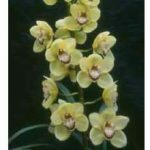 Young seedlings or mericlones may take a few years to flower, but when they do, you have the right to call yourself an accomplished cymbidium grower.